Sociopathic and psychopathic women are some of the worlds greatest deceivers, liars, and con artist. They seem innocent and confident. They are always charming and precise in everything. In the beginning they will use their charismatic persona to make a great impression on you. They will drop surprise gifts with a smile on their face, without any notable reason. They will talk to you about subjects that are important to you. At times, they will ask you why something is important to you. They are trying to find out things about you - to use it against you later. They are looking for your weaknesses and vulnerabilities. They will ask personal questions, asking as if they care so much - then use your answer later on in order to destroy you with it. Know that, even though they seem nice and friendly, Trustworthy and ethical, understand that they are FAR from it. If your skin crawls for no reason while talking to someone, it’s best to get away from them and avoid that person in the future. REMEMBER YOUR LIFE IS AT STAKE. Once involved with this "wolf in sheeps clothing" you are at risk for living a very unhappy life. If you happen to have children with this psychopath, you will spend the rest of your life being bullied, threatened, black mailed, guilt tripped and manipulated. The Psychopathic/Sociopathic Personality is extremely dangerous. Not only are they skilled in destroying you from the inside, out, they are also very adept at ruining other’s lives, while using the victim as their own pawn. There are no limits to what the Psychopathic/Sociopathic personality is capable of. They will blind-side you, even when you feel you have done well to cut him/her off at the pass. When you have trained yourself to think like them, in order to protect yourself. You will never be fully aware of what this individual is doing, until it’s already happened. Many tend to become more care-less with age. Meaning the older they get, they less cerebral they are, the more lies they have to remember, the more fried their brain is from their careless lifestyle, of drinking and a using drugs. Sociopaths will not usually keep there facade up after the age of 40. They begin to slip up, the mask begins to come off and they become exposed. Then once people figure them out - it's over for them. They are reduced to committing petty fraudulent acts, but are unable to manipulate others like they use to - because now everyone has been screwed over or lied to by the sociopath and no one wants anything to do with her. Yet she will still parade around like she is above everyone else. She will usually turn to the Internet to project her lies and manipulation. I still remember all the horrific things my ex wife did to me, and that she still is doing to me, and my wife, and my child and even to my step daughter, who is very young. All her extreme manipulation, guilt tripping, blaming, accusing, bullying my wife, and my step daughter. It was when she verbally attacked my step daughter, I realized I was not dealing with a normal person anymore, I was dealing with a monster, who had no conscious and didn't care who she hurt. She was evil. She is a bad human being. I was and am 100% positive I am dealing with a Psychopath. She knows I am no longer the person she "thought" she could manipulate and put down. Even after our divorce, I still did as she told me to. It was my wife who made me realize there was something "NOT NORMAL" about the situation. 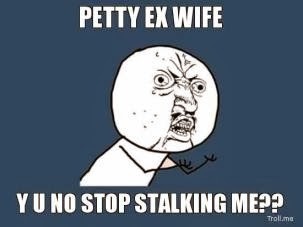 That ex wives are ex wives for a reason. I did not owe her anything. All I was responsible for was making sure my child was taken care of. She expected me to come to her home in Christmas morning and put together toys for our child, in the house she shared with her new husband (one of the many men she was having an affair with during our marriage) I had a new family and once I remarried my obligation is to my wife. I see my child and he opens the gifts we get him at our house on Christmas. I will NEVER SPEND ANOTHER HOLIDAY WITH MY EX AGAIN. Recently her mother threatened me in a text message, threatening my life. Then proceeded to call my work and change up very important meetings. That's when I knew I had to take drastic measures. Even if it that means taking legal action against her, filing a protection order, it's obvious she doesn't plan on respecting my boundaries or me. She is an evil, conscienceless, lying, and conning Psychopath. She has made accusations on my wife. Everything from posting all over the Internet that my wife is obsessed with her. Jealous of her. Insecure. And when my wife had enough she defended herself, which made the psychopath even more fueled to post slander and defamation about my wife. She was vilifying the real victim. Everything she accused my wife of - was exactly the things she was doing to my wife. It is obvious to me, my wife and the rest of the world who is really insecure and jealous. The psychopath! My wife Has everything the psychopath wishes she possessed. Which is beauty, youth, intelligence, persistence, and what the psychopath really hates about my wife is her kindness, and how liked she is by everyone. The psychopaths actions are so predictable that my wife is afraid for her safety and her daughters. Now the psychopath can finally see that she is unable to manipulate me anymore. I never respond to her. What is the point? Everything she says is a lie, 100% a lie. For. Telling me that my child had cancer, to depression. I communicate with my child, not the mother because she is so insane. This is our situation, we are in a court battle with my boyfriends ex-wife & his 12yr old daughter who seems to be following in her mothers footsteps. In adfition the 12yr old is fueling her psychopathic mother with constant lies about anything and everything. His daughter has taken upwards of $3500.00 in jewlery, cash from my wallet, & clothing from myself and my daughter (& caught multiple times) in addition to stealing prescription drugs(schedule II) from family members & grandparent's etc., threating to bring a gun to school and kill kids(which is terrifying since she has access to multiple types of guns at her mom's boyfriends house.Ex-wife (she's extremely violent, with many assult charges against her from others in addition to my boyfriend(ex-wife also attacking him with a knife and had to being physically removed by the police when they were married, children always witnessed these act of violence)(physically attacking me, prior to me even knowing who she was in the middle if a street)(theating to beat me up in front of her children at ER)(terrifying my 13yr old daughter to the point shes affaid to leave the school building while she's outside)(vandalism to our vehicles, etc)the list goes on & on. We had to start locking up anything and everything we can but it doesn't seem to stop. This child is so out of control (with her mothers help of course).Efforts to get this little girl help multiple times and her mother will interfere (ex-wife claims (I)am the problemm). Along with this we had to take the 12 year old daughter to the emergency room for a threat of suicide where her therapist spoke with her as if she was 2 to 3 years old and proceeded to feed her answers when she wouldn't speak about why she wanted to hurt herself again this is multiple threats at suicide. Instead of sending her to a facility equipped to deal with her situation and evaluate for her suicide threats she was released to her mother's care. (who has had a gun pulled out of her mouth on several occasions,& in front of her children)This whole situation has been tearing us apart. She refuses to come to home & punishment don't seem to work. My boyfriend also has a son who just turned 10yrs old(same mother). He seems to understand that lying, stealing, hurting others is wrong. He continues to come home every other week & has expressed his relief that his sister has not been coming every other week with him. He has been abused by his sister since he was a baby. And since he's had time with us alone, he's opened up about what has been going on, without fear from the sister & his mother.Court order for children to be here every other week is never enforced when it comes to his twelve-year-old daughter. His ex-wife taking him back to court and is now seeking full custody for both children. She has a history of drug and alcohol abuse, multiple citations for being under the influence of drugs and alcohol while driving. Yet my boyfriend doesn't seem to think this is completely abnormal & only seems to hold his ex- wife accountable. Refusing to see his daughter is following in her mothers footsteps. He allows his daughter to continue with her lies refusing to knowledge that there's a problem here and that she needs professional help. I'm so frustrated I just don't know what to do. My boyfriend admits to seeing it he understands what's happening he knows what's going on but in the same breath refuses to believe that there's really anything wrong with his daughter. Help! !